I’ve been viewing an online photography course called Photoshop for Photographers, taught by Ben Willmore and presented on creativeLIVE.com. I’ve been using Photoshop for years and have viewed many tutorials and read various books and articles on how to use Photoshop. Still, watching this course gave me some deeper understanding of how to make the most of Photoshop along with learning some new techniques that I hadn’t tried before. One of the course topics that I found really helpfull dealt with retouching images, especially how to best make use of the Clone Stamp, Spot Healing Brush and the Healing Brush. 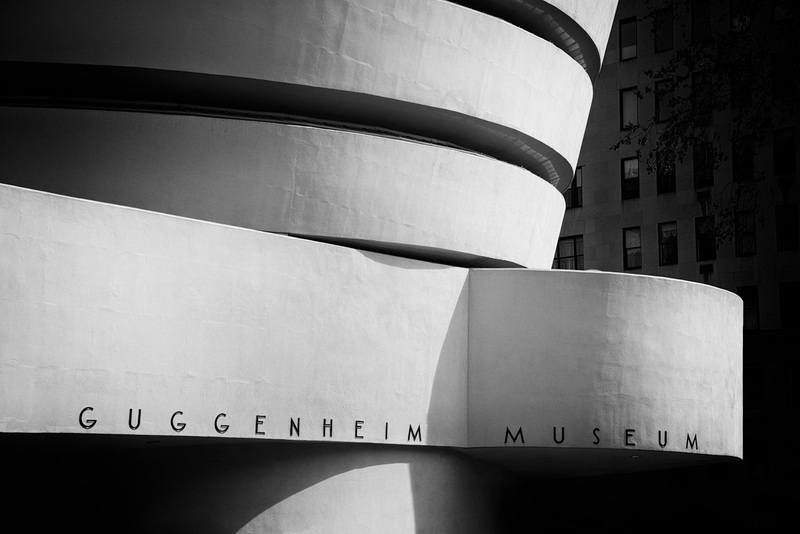 I decided to look for some images in my catalog that I could practice on and I came across this image of the Guggenheim Museum in New York City that I had taken a few months ago. I really like the look of the Guggenheim, one of the last buildings designed by architect Frank Lloyd Wright. However, exterior shots are somewhat difficult because there is always so much activity in front of the museum. The sidewalk in front is full of art vendors, food vendors, etc. I wanted to get a shot that was more abstract, and having people and other objects in the shot just didn’t work. If you look at the as-shot image below, you will see that I managed to avoid most of the street level noise, but I still had to deal with a big van, some signage and other items. I thought this might make a good image to try practice my healing/cloning skills. Since I knew that I wanted to create a black and white image, the first thing I did was take the image in to Silver Efex Pro 2 to see create an initial black and white image. I was going for a high contrast image and I knew that parts of the image were going to be made dark, especially around the edge, so I wanted to see what areas really needed to be cloned out. After looking at this image, I could see that some areas didn’t really need to be cloned, they would just be made black in the final image, but other areas would still be visible. It was these areas that I focused on when I edited the image. I used primarily a combination of the Clone Stamp tool and the Spot Healing Brush. I used the Clone Stamp tool to isolate areas to be cleaned, and then used the Spot Healing Brush to do a content aware fill of the area. Most of the time this resulted in a good result. Sometimes it took a little more work. One of the toughest areas to deal with was a sign on a post in front of the museum. The brush did a nice job of filling the area, but the area on either side of the pole was transitioning from bright to dark. The brush took out the pole and tried to ‘heal’ the area to blend in, but it created a visible line where it tried to blend the two areas together. I tried a variety of things to get rid of it, and finally I just used a noise layer and blended it in to help mask the problem area. The rest of the image was reasonably easy to work with and I think the results came out fine. Fantastic image. CreativeLive is a great FREE service from Chase. I did not see this one. Thanks for pointing it out James. Keep up the great work! Thanks for the comment! I do like the fact that you can view the courses for free when they are first presented. I purchased a copy of this course after watching some of the content (I didn’t have the free time to watch the entire course live). Ben Willmore is a great Photoshop instructor and I realized just by watching a couple of the segments that I would learn a lot from the entire course, even if some of it was stuff I already sort of knew how to do. This is the third course I’ve watched/purchased from creativeLIVE and I have not been disappointed. I love the conversion of the B&W. Great job. This is a very nice abstract B&W. Nice work on getting rid of the distractions along the bottom edge. Thanks. I definitely think it improved the image and it was sort of fun to try and make it happen. What a clever image, James! Excellent work! Sweet lines in this, love the mono look for it.